First off, I can’t believe it has taken me this long to get to Angelette’s Cajun Kitchen, but better late than never! I am a big fan of Cajun and Creole dishes, we try to visit New Orleans at least once a year so that I can eat my way through the city. 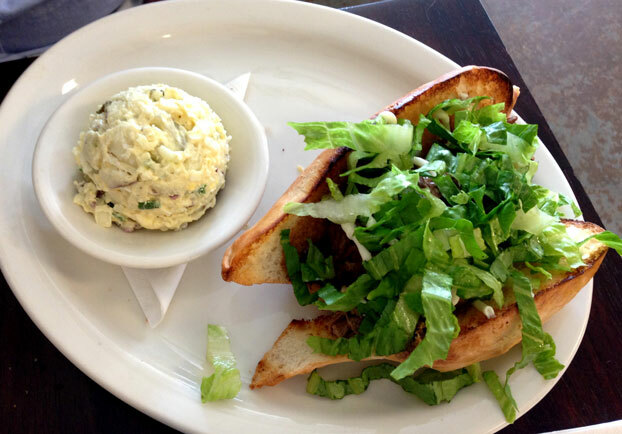 Tallahassee has some decent New-Orleans style restaurants, to varying levels of success (exception the short-lived Tallahassee location of Stinky’s Fish Camp – which had the best po’ boy I have ever had in town). I had heard that the brunch at Angelette’s was amazing, but it is hard to get from the NE side of town to Southwood on the weekends for us with various activities always keeping us busy. But I knew that I could get breakfast dishes any time there…so why go at lunch? The gumbo was rich and flavorful without being very heavy. Nice chunks of sausage and chicken were liberally sprinkled throughout the gumbo, and you can tell the roux was cooked to a deep rich brown. The bread toasts that accompanied the gumbo were light and buttery – perfect to dip and sop up the sauce. My Eggs a la Duane arrived soon after the gumbo, and it was amazing. 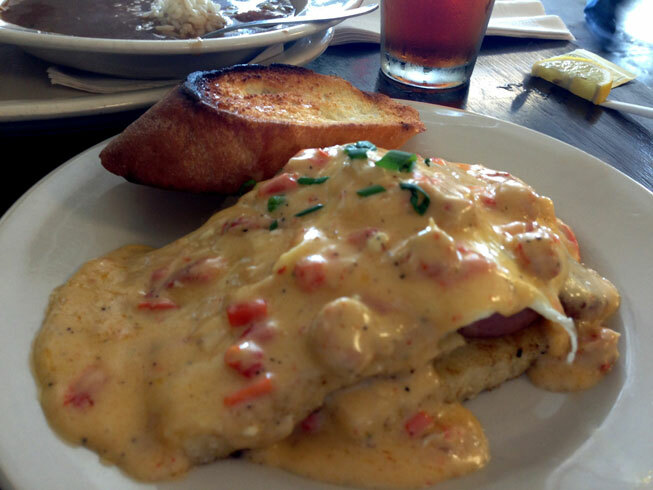 It is a crawfish cream sauce over pan-fried grit cakes, seared andouille, and eggs over easy. Not a light dish, but man was it good. The sauce was creamy and well-seasoned, including lots of lovely crawfish pieces. The over-easy eggs became part of the sauce and made a wonderful bite with the grits and sausage. This dish also came with toasted butter bread (score!) – critical to cleaning up any remaining sauce.